You're standing in we middle or nowhere, cradling a loaded uzi. Joining you on a makeshift firing line are 12 strangers. They're just as armed as you are, and eager to open fire. The mind races. What If the guy next to me lost his job yesterday, the day after his wife left him for his best friend? And what about the gal down the line? She looks mighty tense; what If she's enraged over the violent state of the world and ready for payback? You can only speculate, because you don't know a thing about the mental state of this army. All you know is one careless move by one of 'em - or one crackpot who slipped past the background check - and you're a goner. Then this armed guy called a range master shouts, "Ready ... fire!" By now, you're likely asking a question that begins, "Who in their right mind ..?" We can't blame you, because we would've asked the same thing before we lived this scenario during an exhilarating - and highly educational - day at Front Sight Resort, a state-of-the-art firearms training facility and future master-planned community in the middle of the desert just south of Pahrump. "This isn't Bubba and his buddies showing up with a six-pack and shooting things up," says Ignatius Piazza, a chiropractor, four-weapons combat master and gun enthusiast whose vision became Front Sight. "And there's no overthrow-the-government talk." Ignatius Piazza wants you ... to grab an uzi and a fistful of bullets and focus on the front sight. And he wants you to do it all compliments of him. 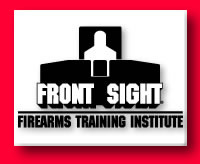 Even if you're not interested in a membership - or even if you're not a card-carrying member of the NRA - Piazza invites you out to Front Sight to learn what makes a machine gun - and those who operate them - tick. (The free courses are offered two weekends each month.) "We teach how to shoot to stop, not shoot to kill," Piazza insists. "We're part of the solution to gun violence. And by the time you leave here, I promise that you will have received better training in how to handle and operate a gun than your average police officer." And we promise that you'll have a blast!